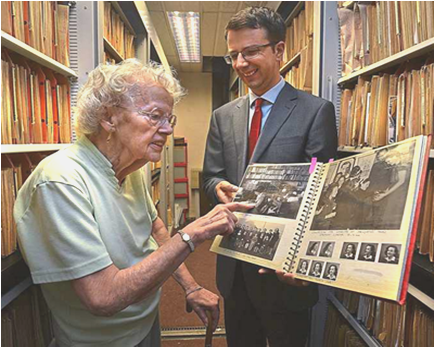 Hazel was straight out of school in 1942 when she came to work as a librarian at the Express and Star Queen Street head office. She was the person responsible for cataloguing photographs. 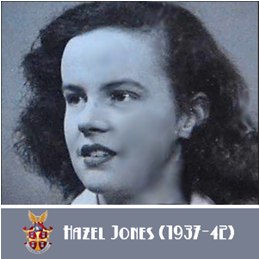 Hazel spent seven years with the E&S from the age of 16. She later moved to London and worked for the Mirror Group of newspapers just off Fleet Street until 1989 but has now retired and is living in Penn. 88-year-old in 2014 Hazel backed a bid to digitise the photographs she catalogued all of those years ago which will preserve them for generations to come and make them available to all via a database. Standing in the E&S archive, stuffed with envelopes containing our own precious images, Miss Jones recalls the way she and her supervisor, Dora, would work. "I had no experience after leaving school," Miss Jones says. "For the first six months whenever Dora went on her lunch break she would leave me with a copy of The Times and The Daily Telegraph to read cover to cover and then set me questions on it. She realised how ignorant I was." Miss Jones became responsible for the photographs. "There was little newsprint at the time because of the war," she says. "Whenever a picture of someone was needed, there would be a little head block. It was metal with their picture etched into it. Part of my job was to go to the store to collect it for filing." Today, reporters and news editors can find pictures in a matter of seconds. But Miss Jones played a vital role in the production of the newspaper. "If anyone needed a picture we could usually find it for them in a few minutes and bring it to them," Miss Jones says. "The important thing was to make sure there was a full caption on it. A habit I picked up from my career was to caption every photograph I take. You had to have your five Ws – who, what, why, where and when. Without them, it would be lost in the library." After Hazel left the Girls' High School in Wolverhampton her first job was with the Express & Star in the photographic department (see article above). She left the Express and Star at the age of 23 and moved to London to further her career. There, she worked for the Mirror Group of Newspapers. She had a long successful career, becoming the Chief Picture Librarian buying selling and categorising photos for publication all over the world. She remained living in London for the rest of her long working life and long after retirement age but finally moved back to Wolverhampton at the age of 79. There she lived at Pendene Court on the Penn Road, two or three minutes from where she was born. She had gone full circle. Her life at Pendene was a happy one she was an integral part of the social committee and helped raise a great deal of money for various charities while she was a resident there. Hazel passed away in New Cross hospital on the 26th January 2017 after a short illness she contracted after breaking her leg - she did not seem to recover from this. Hazel was a much-loved sister, a beloved aunt and a friend to many and has left us with many happy memories. She lived a full and happy life and lives on in the memories of her friends and family.